Welcome Steve, glad you're here and thank you for joining LoTW.. Thanks Steve, Your confirmations via LoTW are very welcomed. Steve, the percentage of the confirmed QSOs should be much higher, probably closer to 50%. In my experience, Steve should not expect an overall 50% confirmation on a log going back 18 years. Steve's overall 33% confirmation rate for QSOs made since 2001 is consistent with this pattern. 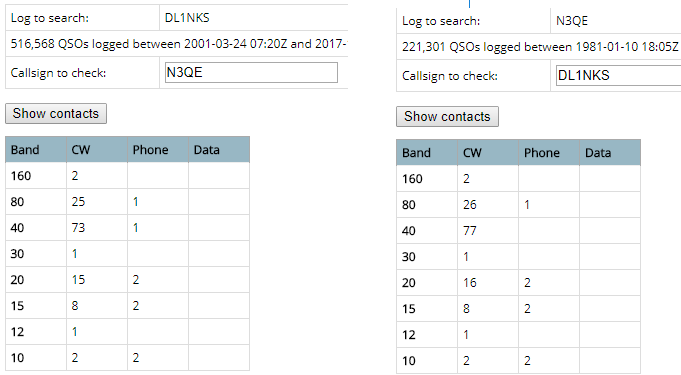 Thus the higher the percentage of digital mode QSOs you've logged, the higher your LoTW confirmation rate will likely be. All FT8 QSOs were made since July, so their confirmation rate is driven by both their recency and their high probability of computer logging. Dave, thanks for the analysis. Makes perfect sense now. How about to Uses LOTW? Yes yes, five hundred thousand times yes! Thanks for all the Q's, Steve! "QSL cards are in printing. Soon QSLs for direct OQRS and sponsor QSOs will be mailed. On 10th of December also priority LoTW upload will be done for sponsor and direct OQRS QSOs." Yes LOTW was easy for me because of using Clublog before I only had to push one button and all my QSOs were exported from Clublog to LOTW. great. Hi Steve! Thanks for the QSO confirmation as well from our QSO last month! I remember you mentioning to me that you had seen my posts on eHam Happy to see you join the group! S79K - Seychelles - has uploaded to LOTW. VQ917JC - CHAGOS ISLANDS - is on LOTW now. If his logs go back to 2001, his match rate should not be so high. LOTW was insignificant until 2004 and took a while to ramp up, too. A lot of folks have not bothered to go back to QSO number one (those may be on paper or otherwise hard to access) and in their individual cases, decided to upload from whatever date they registered. OH0Z on 160 CW confirmed by LoTW! Worked this past weekend in the ARRL 160 contest.